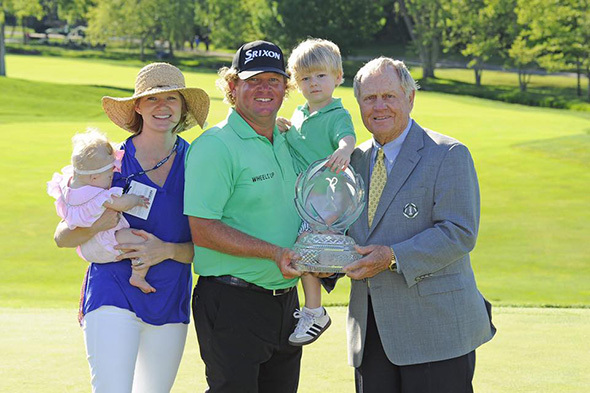 Officials of the Memorial Tournament presented by Nationwide announced today that the Tournament has accepted entries from defending Memorial winner William McGirt, World No. 1 Dustin Johnson and reigning FedExCup Champion Rory McIlroy to compete in the 42nd edition of the prestigious invitational hosted by golfing legend Jack Nicklaus. Also joining the field are Hideki Matsuyama and David Lingmerth, Memorial Tournament winners from 2014 and 2015, respectively. The Memorial Tournament presented by Nationwide is May 30–June 5 at world-renowned Muirfield Village Golf Club. McGirt, 37, is coming off a career 2016 season. His playoff victory over Jon Curran was his first on the PGA TOUR. He followed with two top-10 finishes in his next five starts for a total of seven on the season, a career best. His 2016 earnings of $3.6 million were also a career high. McGirt has continued to play well during the 2016–2017 campaign with three top-10 finishes, including a T3 at last week’s RBC Heritage. Competing in his first Masters Tournament earlier this month, McGirt played solidly to remain in contention through the first three rounds before a final-round 74 led to a T22 finish. He is currently ranked No. 44 in FedExCup points and in the Official World Golf Ranking. The South Carolina resident will be making his fifth start at the Memorial, where he’ll attempt to be the first player to defend his title since Tiger Woods dominated the event with three straight victories from 1999 to 2001. McGirt’s scoring average at Muirfield Village Golf Club is 71.64 to go with career earnings of $1,580,247.55 in the Memorial Tournament. Johnson, 32, is coming off a career year on the PGA TOUR. He recorded 15 top-10 finishes over 22 starts, including three wins and his first major championship title at The U.S. Open. Johnson’s stellar season led to a sweep of the PGA TOUR’s post-season competition-based awards. Johnson was a first-time recipient of the Jack Nicklaus Award as the PGA TOUR Player of the year, the Arnold Palmer Award as the TOUR’s leading money-winner with more than $9 million is earnings, and the Byron Nelson Award winner for lowest adjusted scoring average at 69.17. Since recording his first TOUR victory in 2008 at the Turning Stone Resort Championship, Johnson has posted at least one win each season en route to 15 total PGA TOUR victories and $44,378,344 in career earnings. A resident of Myrtle Beach, S.C., Johnson has continued his inspiring play this season with five top-10 finishes in just seven starts, including wins in his last three tournaments, propelling him to the No. 1 ranking in the world for the first time in his career, as well as the No. 1 spot in the FedExCup rankings and the PGA TOUR money list with $5,346,600. Johnson will be making his 10th Memorial start and has career statistics that include earnings of $1,215,201 and a 71.47 scoring average. Johnson finished in third place last year after rounds of 64, 71, 68 and 71. Reigning FedExCup Champion McIlroy will be making his seventh start at the Memorial Tournament presented by Nationwide. He has finished inside the top-10 on three occasions, with his best outing coming last year when he tied for fourth place. His scoring average at Muirfield Village Golf Club is 70.77 to go with career earnings of $854,689.50. He posted his lowest 18-hole score at the Memorial in 2014, when he fired a 9-under-par 63 during the first round, in route to a T15 finish. The 28-year-old from Northern Ireland has recorded 13 PGA TOUR victories and garnered $35,489,212 in TOUR earning since turning professional in 2007. The four-time major champion and two-time PGA TOUR Player of the Year has recorded a win in six of the past seven seasons on TOUR, bringing home multiple wins in four of those years (2012, 2014, 2015 and 2016). McIlroy is ranked No. 2 in the world and No. 41 in FedExCup points on strength of an impressive four top-10 finishes in five starts this season. Matsuyama, 25, is coming off a successful 2015–2016 campaign on the PGA TOUR in which he recorded eight top-10 finishes in 23 starts and etched career-bests in earnings ($4,193,954) and the final FedExCup standings (No. 13). He started this season on fire with four top-10 finishes in his first eight starts, including two wins and two second place efforts. His T11 finish at The Masters Tournament was his third consecutive top-15 finish at Augusta. Matsuyama is ranked No. 4 in the world and stands No. 2 in FedExCup points and on the PGA TOUR money list with $4,762,957. Competing in his first Presidents Cup in 2013 at Muirfield Village Golf Club, he went 1-3-1 for the International Team. In 2014, the Sendai, Japan, native became the youngest player to win the Memorial and the first since Roger Maltbie, who won the inaugural event in 1976, to record a victory in his first start at Muirfield Village Golf Club. He finished T5 in defense of his title in 2015 to bring his Tournament earnings to $1,342,300, but he missed the cut last year. His scoring average over 10 rounds at the Memorial is 69.80. Lingmerth, 29, had his best season in 2015 when he defeated 2010 Memorial winner Justin Rose in a playoff for his first win on TOUR and he earned more than $2.7 million. He continued to play well during the 2015-2016 campaign with eight top-25 finishes, including a runner-up effort to Jason Dufner in a playoff at the Career Builder Challenge in partnership with the Clinton Foundation. Lingmerth is currently ranked No. 170 in FedExCup points and No. 109 in the Official World Golf Ranking. The native of Tranas, Sweden, will be making his fifth start at the Memorial, where he has a scoring average at Muirfield Village Golf Club of 70.81 to go with career earnings of $1,203,925.67 in the Memorial Tournament. In other news, Tournament officials also announced today that tickets for the 2017 benefit concert, IGS Energy Evening with David Gray presented by City of Dublin, and race entries for the FORE! Miler presented by OhioHealth remain available. The 2017 benefit concert, IGS Energy Evening with David Gray presented by City of Dublin, is set to take place Saturday, May 20, at EXPRESS LIVE! in Columbus. The annual charity event, now entering its 11th year, has raised more than $690,000 for the Nicklaus Children’s Health Care Foundation and Nationwide Children’s Hospital alliance in support of the Memorial Tournament Neonatal Intensive Care Unit (NICU) at Nationwide Children’s Hospital. VIP doors for the benefit concert open at 6 p.m. EDT. Tickets are available at $175 per person or $350 per couple. For more information, please visit www.mtbenefitconcert.com or call 614-355-5410. The third annual FORE! Miler presented by OhioHealth will begin at 7 p.m. EDT on Thursday, May 25. The race will follow a route that starts and ends at Muirfield Village Golf Club and includes Memorial Drive, Avery Road, Brand Road, Muirfield Drive and Kinross Court. After the race, runners and walkers will enjoy a free Post-Race Party at the Golden Bear Club, an enclosed, climate-controlled venue located between the fairway at Hole No. 10 and the green at No. 14 at Muirfield Village Golf Club. The FORE! Miler is limited to the first 3,000 runners and walkers. Registration for the FORE! Miler is open at www.foremiler.com. Race fees are $50 per person from April 1 through May 22; and $55 per person starting May 23 until sold out. All proceeds from the FORE! Miler benefit Nationwide Children’s Hospital. The race has raised more than $81,000 for Nationwide Children’s since it began in 2015. Race participants receive an Official FORE! Miler-themed Technical Race Shirt, an Official FORE! Miler-themed Finisher’s Medal, one complimentary Practice Round ticket ($35 value) to the Memorial Tournament presented by Nationwide (good for any one day, Monday, Tuesday or Wednesday, with Wednesday’s ticket including access to the Official Pro-Am and Memorial Honoree Ceremony) and a complimentary adult beverage at the Post-Race Party (21 and over).